Underfoot burning, heating of the arches, pain on the soles, etc. 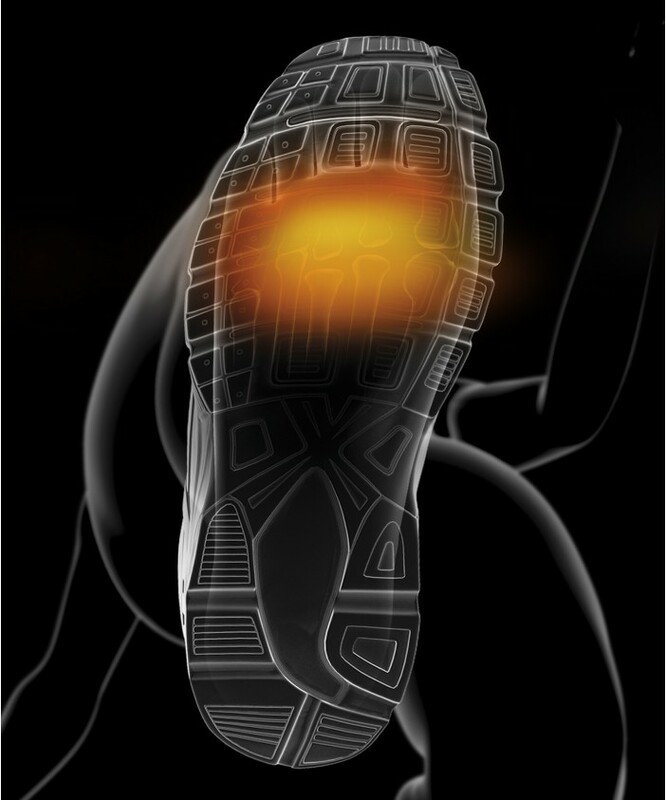 are some of the terms used by athletes to describe their foot pain while walking (e.g. hiking) or while playing a sport that heavily relies on the soles of the feet (tennis, football, rugby, handball, basketball, running, etc.). Fortunately, there is now a silicone foot pad that relieves foot pain and stays perfectly in place during sporting activity. - PROTECTIVE ACTION : They incorporate a silicone gel, only 1.7 mm thick, which was specifically developed to effectively distribute pressure and absorb friction without creating instability under the ball of the foot. This allows the preventing of any risk of overheating, burns, blisters or calluses. - ANTI-PAIN ACTION : EPITHELIUMTACT 05 cushions stop the pain, making it possible to participate in sports and remain competitive. ERGONOMICS : This concentrated technology in less than 30 g, EPITHELIUMTACT 05 Plantar Cushions were specifically designed for sports that use the ball of the foot (tennis, football, hiking, running, etc.). Their hold is ideal due to a support strap with interlocking teeth (inside) and a silicone mesh creating an anchor with the sock (outside). The plantar cushions are compact and fit into all footwear. 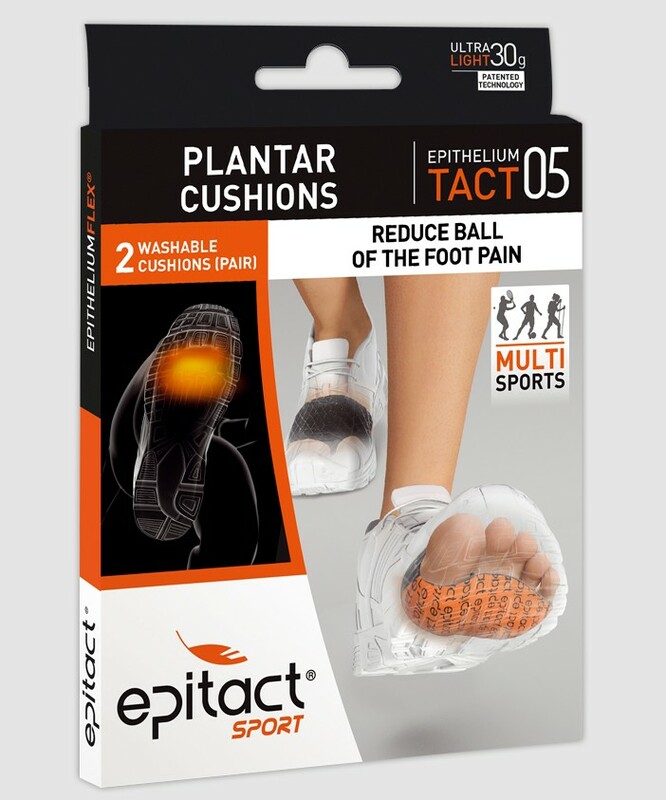 PRESENTATION : EPITACT® SPORT Plantar Cushions are sold in pairs. These protectors should be used directly on the skin. • Put on the plantar protector and place the support strap between the big toe and the second toe (1). • The interlocking silicone dots (on the inner side of the strap) should be in contact with the skin, with the silicone meshing (outer side of the strap) in contact with the sock. 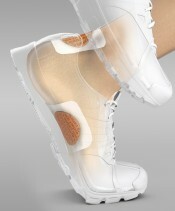 • Adjust the position of the plantar protector at the base of the toes (2) taking care not to pull the strap too tight. • For optimum support, do not wear the protectors barefoot.Always wear socks over the top. Do not apply moisturising products before use. • Machine wash at 40°C or hand wash (without rubbing), leave to dry naturally. IMPORTANT! To guarantee good hold, the protectors must be washe after each use. 74 % silicone, 26 % polyamide/elastane fabric. • Do not use on an open wound. • Persons suffering from arthritis, diabetes, polyneuritis, and neuropathy of the lower limbs should not use this product. The product has undergone all the regulatory tests required by ISO 10993-1 relative to products that come into contact with the skin. However, if any skin reactions are observed, stop using the product immediately and contact MILLET Innovation. How do I chosse my size ?